Total color blindness is a severe vision impairment leaving a person completely unable to distinguish any color – seeing things only in grayscale (shades of black and white). There are two types of total color vision (or monochromacy). Rod monochromacy is a rare, non progressive inability to distinguish any color, resulting from non-functioning or absent retinal cones. Rod monochromacy is typically associated with sensitivity to light (Photophobia) and poor vision. 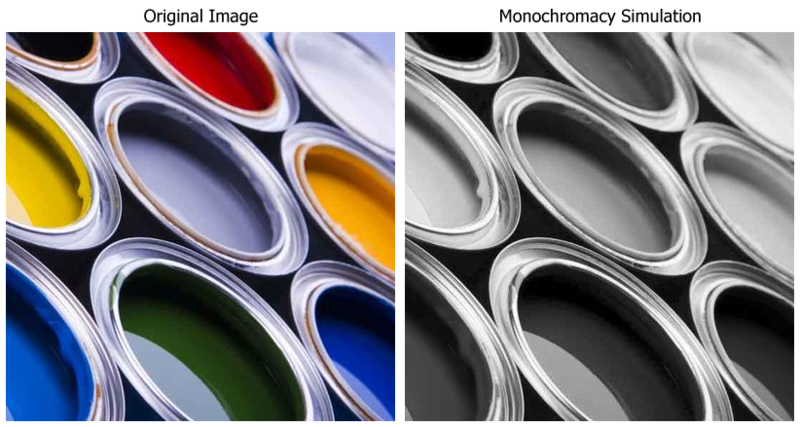 Cone monochromacy is also a rare type of total color blindness, however is accompanied by relatively normal vision. Being totally color blind makes everyday life much more challenging. The ability to tell the difference between colors of a similar level of brightness becomes nearly impossible, whereas to a normal person – these colors may be totally different. For example, confusion of colors such as green and blue, and yellow and white is to be expected. Rod monochromacy is the condition where the rod cells of the retina are present and functional, but all types of cones are either non functional or missing. Even as the more common form of total color blindness, rod monochromacy is thought to only occur in around 0.003% of people or less. Completely unable to distinguish colors. You may have heard that dogs can only see black and white, this used to be a confident claim about most mammals. However in recent years there has been evidence that at least some mammals have at least dichromatic color vision. It is now considered possible that animals such as dogs, horses, bulls, and many other mammals may be only red green color blind.